I know people like to push the limit with Halloween Costumes but the Ray Rice Domestic Violence varieties are a Big Fat I CANNOT WITH YOU PEOPLE! 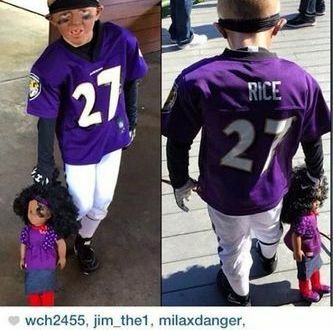 But the really low is PARENTS dressing their KIDS up in Ray Rice Domestic Violence Walking Drag- SAD. Just because they are old doesn’t mean they are dying!